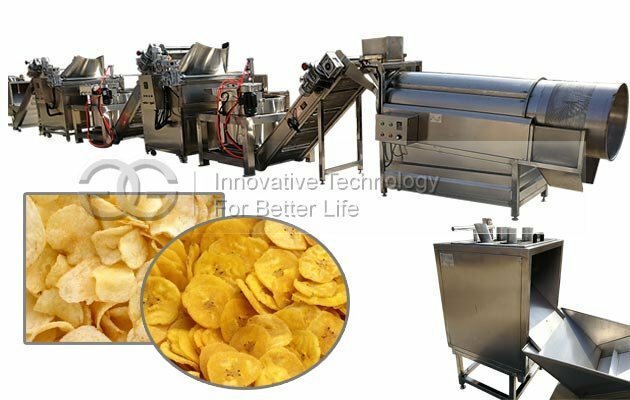 This banana chips production line is suitable for producing banana chips, potato chips. Production capacity can be customized, ideal equipment for chips processing manufacturers. GELGOOG offers professional automatic plantain chips production line, which is very popular among the customers. Fried plantain chips is made from plantain after peeling, slicing, frying and seasoning. 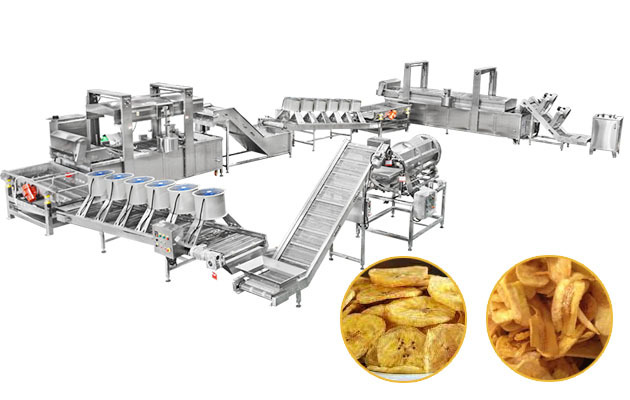 Production capacity of this plantain chips production line can be customized, suiatble for large output, also small scale chips processing manufactures. 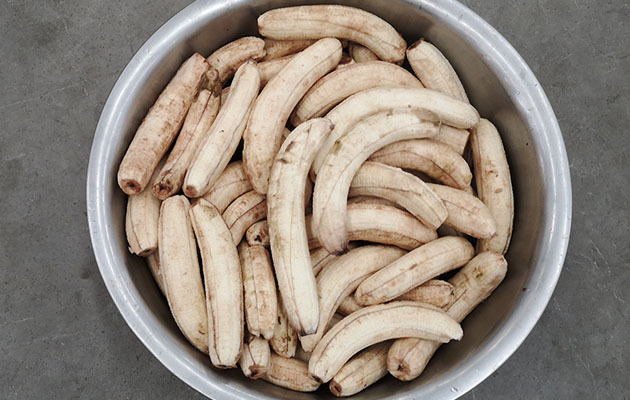 Plantain peeling(manual) -- Plantain slicing -- Banana slices blanching -- Banana chips frying -- Banana chips de-oiling -- Plantain chips seasoning -- Banana chips packing. 1. Banana slicer machine: This machine is used for slicing bananas into slices, and the thickness can be adjusted at your will. 2. Banana slice blanching machine: This machine is to sterilize banana slices and ensure their brightness and crispy. 3. Dewatering machine: Adopts centrifugal principle to remove the surface water from banana slices, ready for frying part, also shortens the frying time and perfects the taste of the plantain chips. 4. 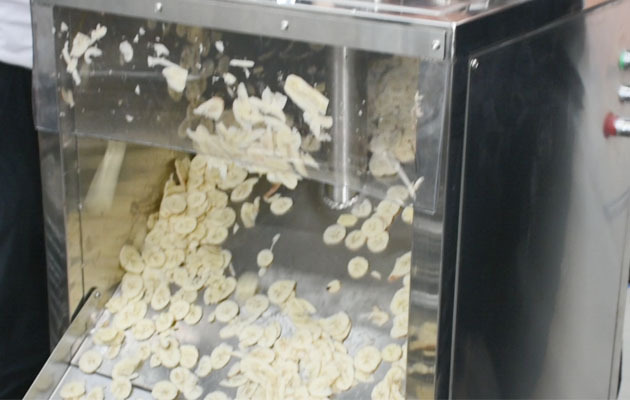 Banana chips frying machine: Uses oil-water mixing technology, extend the service life of oil. 5. 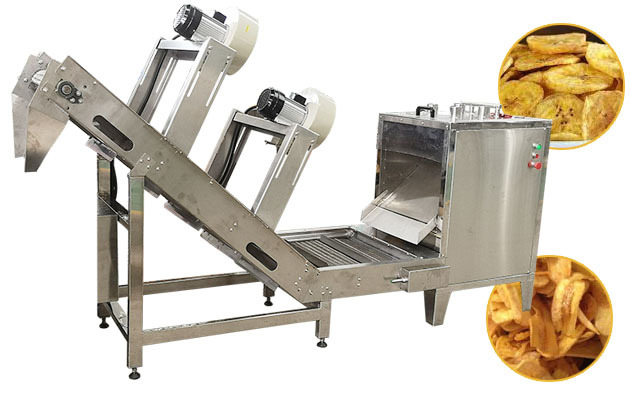 Deoiling machine: This de-oiling machine is to reduce oil content and ensure the taste of fried banana chips. 6. Seasoning machine: Season the fried plantain chips evenly, which makes them taste nice. 7. Packing machine: The packing machine is suitable for packing banana chips into bags, which improves the packing efficiency and saves a lot of time.